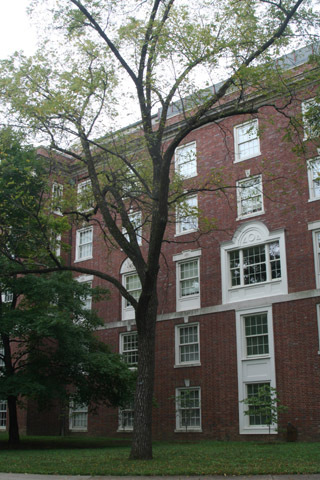 This large tree grows in the open space between North Hall and the Cohen Building, on the south side of the sidewalk. Black walnut leaves are one of the largest singly pinnate (leaflets arranged along a single central rachis) leaves in this area. Trees with similar leaves are tree of heaven and pecan. The leaflets of tree of heaven have a distinctive gland in a notch at the base of each leaflet. Walnut leaflets do not have this gland. Walnut twigs also have unusual chambered pith (please do not cut branches or twigs from trees on the Vanderbilt campus) and tree of heaven twigs do not. This large walnut tree shows the distinctive furrowed bark of walnut, which is quite different from the smoother bark of tree of heaven. Pecan trees are not common in the wild in this area so they aren't likely to be confused with walnut there. Pecan bark is also not deeply furrowed and its twigs do not have chambered pith. If the fruits are present, these three trees can't be confused. Walnuts are very hard, round, and surrounded by a thick husk that doesn't split along any particular lines. Pecans are oblong with a thinner shell and when ripe, their husks splits fairly easily into several pieces. Tree of heaven fruits are not nuts but rather are thin and winged. A smaller walnut tree may be seen from the bridge to main campus and its leaves can be examined more closely than the leaves of this tree. Black walnut trees are fairly common in forests in this area, although large trees are somewhat rare because they are frequently cut for their valuable wood. This organism is a living specimen that is part of the  Vanderbilt University Arboretum  with the local identifier unnumbered4.